Students from Glenala High School enjoyed International Women's Day at Scania's Richlands branch. 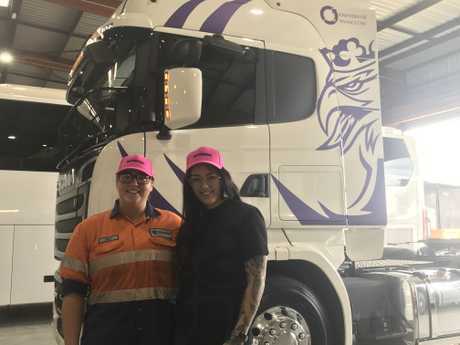 DRESSED in their pink Scania hats and their fluro pink vests, 40 girls from Glenala State School students headed to Scania's Richland branch to find out what goes on at a truck and bus retail dealership. The girls spent the day discussing what it was like to work in the trucking industry with some of Scania Australia's most successful female employees, including people and culture director Michele Gellatly and head of Truck Rental and Used Truck Sales Anna-Marie Taylor, as well as second-year apprentice technician Jessie Woehrle. The students inspected a number of Scania trucks and were taken for a short drive around the dealership car park, and undertook a"'fix-a-truck" challenge, that demonstrated the high levels of technology employed in all Scania vehicles, as well as the computerised diagnostics used in tracing faults and effecting repairs. Jessie Woehrle and Shani Byrnes spoke to the students about how they began their careers in the transport industry. Scania Queensland regional executive manager Richard Singer said the aim of the day was to broaden the appeal of the transport industry to a new generation of Australians and to show that it was not the male-dominated industry that it had been and "may still be percieved as". He said Scania was starting to see a shift as more women took up roles in the workshop as apprentices and technicians, as well as in key positions such as finace, marketing, dealer development and dealer management. "We have serveral very senior positions filled by very experienced and successful women, from national dealer development managers to our chief financial officer," he said. He said the school event on International Women's Day was designed to show young women that there are many different and rewarding career prospects within the transportation industry. Mr Singer said Scania was a leader in the shift towards a sustainable transport system and for students passionate about protecting the environment, Scania was a great place to work.